Neurosurgical Consultants: Understanding Neurological Surgery: Why choose a Neurosurgeon? WHY CHOOSE A NEUROSURGEON FOR BACK OR NECK PAIN? Neurosurgical Spine Care: Neurosurgeons are concerned with the diagnosis and treatment of patients with injury or disease of the Brain, Spine and Nerves throughout the body. Neurosurgeons provide both non-surgical and surgical care, depending on the nature of the illness or injury. Neurosurgeons are trained both as Brain and Spine surgeons. The Nervous System (Brain, Spinal Cord and Spinal Nerves) are all housed within a dense protective bone environment (Skull and Vertebral Column). It is important to remember that ALL Skull and Spine operations are being done to protect and/or repair the Brain, Spinal Cord or Spinal Nerves. Only a Neurosurgeon is trained sufficiently thoroughly to manage the surgical treatments of Nervous System problems related to the interior of the Skull and Spinal Column. In fact, neck and lower back pain (in addition to Brain problems) are common reasons for a visit to our office. At our office, or in the hospital, all evaluations and surgical treatments are provided by Neurosurgeons. A Neurosurgeon is always on call after office hours. Advanced Specialty Care: After four years of medical school and an internship program (and perhaps additional General Surgery training), the physician who enters a Neurosurgical residency program spends another five to seven years acquiring the knowledge and skills required to manage Neurosurgical patients. During this residency, the Neurosurgeon spends over fifty percent of his training in performing spine care. The Neurosurgeons associated with Neurosurgical Consultants, P.A. have additional fellowship training, and after two years in private practice, take a difficult exam for Board Certification by the American Board of Neurological Surgery. Considering all medical specialties  the field of Neurosurgery provides the most comprehensive background education and experience in spine care. Education: Our physicians are involved in research and regularly attend Neurosurgical and International Spine Conferences, providing our patients with the most current spine knowledge that medical science offers. Our Neurosurgeons share their spine expertise by providing lectures to other physicians, healthcare professionals, and the public. We maintain this website as part of our commitment to that education ethic. Neurosurgical Consultants' patients receive extensive explanations of treatment options and carefully written spine educational materials. We encourage the reader to review this website's comprehensive discussion of Spine Conditions and their modern treatment. Technology: If surgery is indicated, be comforted in knowing the our Neurosurgeons are leaders in the incorporation of new cutting edge technologies, offering an advanced level of spine care and surgical outcomes. Our surgeons utilize the most advanced spinal surgery techniques including Minimally Invasive Spine Surgery applications. Figure 1A (Left): Drs. Lazar (Left) & Bland (Right) performing a Minimally Invasive Microendoscopic Lumbar Spine operation. Figure 1B (Right): A closer view of the 16 millimeter diameter Minimally Invasive retractor tube through which this operation is conducted. Figure 2A (Left): Post-operative X-ray image of a multi-level Cervical Spine Reconstruction following C2-C6 Anterior Corpectomies that were required in order to adequately decompress the Spinal Cord and restore Neurological function to this surgeon. 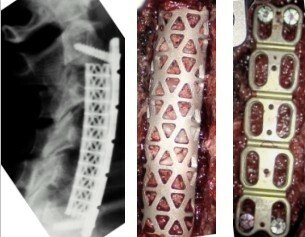 Figure 2B (Center): Operative Photo of the Titanium "Pyramesh" Cage that is used for a solid reconstruction. The Cage is filled with the patient's own bone that is saved during the removal of the Vertebral Bodies. Figure 2C (Right): Operative Photo of the Titanium Anterior Internal Fixation Plate that adds to the stability of the Spine. Neurosurgical Consultants' experts are among the most experienced Spine Surgeons using Bioabsorbable materials as part of Cervical Spine operations. These remarkable materials will disappear from the body within 18 months of operation, once they have served their function and are no longer needed. In those patients where these techniques are appropriate, this means that the long term result is accomplished without leaving a permanent "implant". Figure 3A (Left): Operative Photo of Bioabsorbable Intervertebral "Spacer". Figure 3B (Right): Operative Photo (Same Patient) Bioabsorbable Anterior Plate & 4 Bioabsorbable Screws (Arrows). Outcomes: Neurosurgical Consultants, P.A. takes a conservative approach to spine care, often initially prescribing medications and/or rehabilitation. Physicians associated with Neurosurgical Consultants, who are Fellowship-trained specialists in the non-surgical management of spine problems, have a high success rate in returning patients to good spine health and avoiding surgical treatment. Most statistics show that only one in twelve spine patients actually needs surgical intervention. In our experience, of those patients who require spine surgery, eighty-five percent (85%) are discharged within 6 to 8 hours after operation. Patients who are referred for outpatient rehabilitation therapy also have positive statistics. Our experience reveals that our spine patients require less therapy visits. We have a greater percentage of them returning to work as compared to local and national benchmarks. Staff: Our Patient Support Staff creates an atmosphere of competence, friendliness, and empathy. You will be encouraged to communicate your concerns and ask questions. Every effort is extended to assist you in making informed decisions. Patient Satisfaction: Surveys rank Neurosurgical Consultants, P.A. with superior ratings! It is a practice-wide goal to meet or exceed your expectations  with each and every encounter. Many of our patients have expressed their appreciation as reproduced in our Testimonial Section. Dr. Lazar has been recognized annually by his colleagues and peers as one of the BEST DOCTORS in Dallas since the inception of this D-Magazine independent program (1992 ... 2001, 2002, 2003, 2004, 2005, 2006, 2007, 2008, 2009, 2010, 2011, 2012 & 2013). Patient Education: Neurosurgical Consultants, P.A. exists only for one purpose, our patients. It is our mission to deliver the highest level of comprehensive Neurosurgical care to those whom we serve. It is our belief that part of our responsibility is the education of our patients. Take time to educate you about the particular Neurological Condition; this most often includes sharing with you printed information and/or anatomical diagrams that you can take home to review. Confidence: Since 1973, patients from Texas, Arkansas, Louisiana, New Mexico, Oklahoma, California, Colorado, Florida, Missouri, New Jersey, New York, Canada, Costa Rica, Panama and Mexico as well as other communities and countries have trusted Dr. Martin Lazar and his associates for spine care. We believe that the hallmark of our care is based on exemplary doctor-patient relationships, with a practice philosophy centering on mutual understanding. Convenience: Our main office located at 7777 Forest Lane #B420, Dallas, Texas 75230 is easily accessible and is directly adjacent to Medical City Dallas Hospital, a 598-bed acute general hospital. These facilities are state-of-the-art for the specialized surgical procedures that we offer. The office and hospital are located within easy access to both Dallas Fort Worth Airports (DFW International Airport and Love Field) as well as quality hotels for out-of-town patients and their families. We ask our out-of-town and international patients to consult our International Patient Information area for further helpful information. Covered parking is conveniently located within steps of all of the medical campus buildings. Public transportation as well as taxi and limousine services are readily available.